The tributes continue to flow for Rahul Dravid following his retirement from international cricket. It was the turn of his former team-mates, Anil Kumble, VVS Laxman and Sourav Ganguly, to highlight his contribution to Indian cricket. While Ganguly called him the "best No. 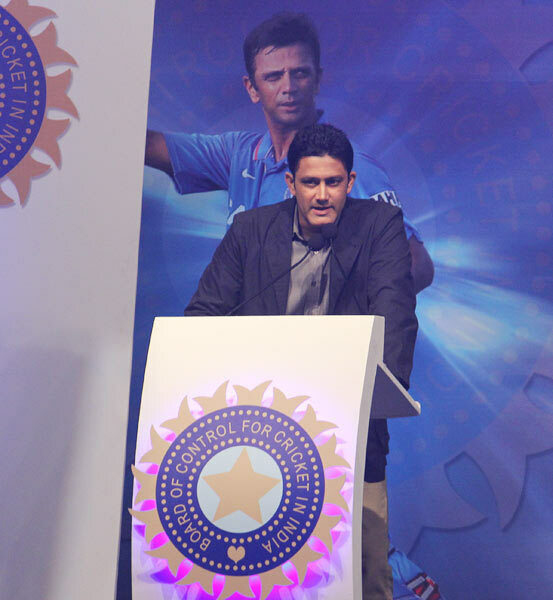 3 batsman in the world", Kumble said he was lucky that Dravid was his team-mate and he only had to bowl to him in the nets. But it was clear that Laxman will be the one who will miss Dravid the most in the dressing room. The tears while watching the latter speak said it all. 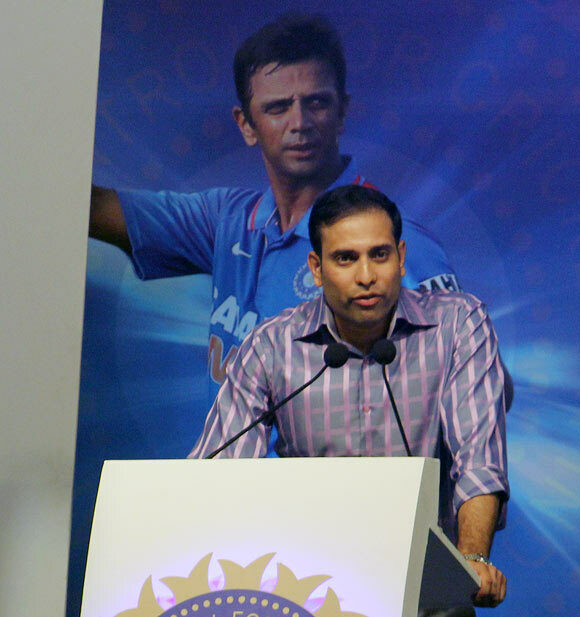 Laxman said he enjoyed a great relationship with Dravid and would cherish the memories. India captain Mahendra Singh Dhoni paid tribute on behalf of his team, saying Dravid will leave behind a legacy that will continue. 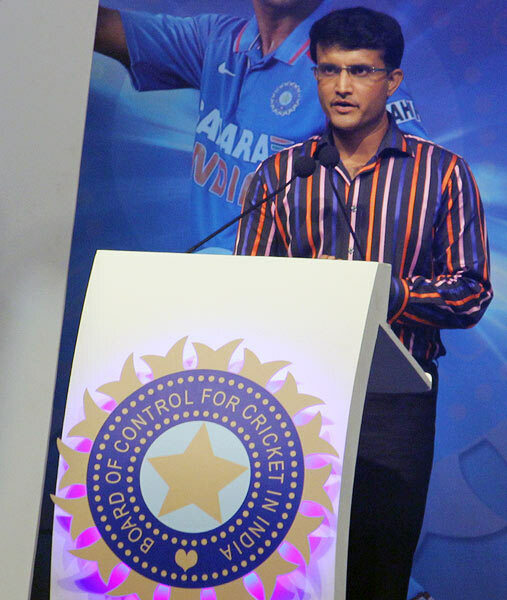 Here's at what all that to said about Dravid at the felicitation organized by the BCCI in Mumbai on Tuesday. The first time I saw Rahul was during the tour of Engl#8743 I don't remember his age, probably 14-15; we went with Kailesh Gatani of Star Cricket Club on the tour which used to be very enjoyable tour those days. We used to play cricket all around the various counties during one month and that was the time I first met Rahul Dravid from Karnataka. I also met him when he was playing Under-15 for Banglore; obviously, he was a shy boy then and very quite one, but I can remember the knock; I don't know where he got hundred. You could see that there was enormous talent in the young boy then; we went on different directions then. We went on to play school cricket and I played more with Anil [Kumble] than Rahul, then saw him again in Ranji Trophy in 1990 when he made debut for Karnataka, where he got runs against Maharashtra and Bengal and fell sick at Eden Gardens. You can make out there is a player with special talent and, hopefully, if he keeps working hard then he could play for India. He not only played for India but he was also the greatest batsman of all time not only for India but in world cricket. It was pleasure playing with you Rahul, for playing with you for so many years and seeing Indian cricket getting better. Along with with the big names we had, like Sachin [Tendulkar], VVS [Laxman], Anil [Kumble], you were one of the huge players as Indian cricket went forward. I was lucky to have a vice-captain like you for the period of five years, along with coach John Wright. And I think lot of people talk about been me the captain, but behind the scenes a lot of work was done by you and John [Wright] which made Indian cricket a successful one. To sum-up your career, I can say only one word: its been outstanding and I'm sure you must be a proud man today when you hang up your boots. And the contribution you made to Indian cricket, not just by the runs you scored, but you played in an era where Indian cricket when strength to strength. I think that will be your biggest contribution than the amount of runs and amount of catches you have taken. I will talk about some of best the knocks you played; there could be lot of debates and argument over it, but I have said before, the knock you played at Eden Gardens with VVS, the best I have seen from you. I have always cherished performances, knocks overseas more important than one in the overseas, but that knock established you not only as a cricketer but it brought about a big difference to Indian cricket. All good things have come to an end, and, similarly, too, like all great players and sportspersons around the world, your career has come to an end. And I am happy that the decision has been taken by himself. There were lot of arguments, talks, there were times I have made comments but I felt he has taken decision at the right time for Indian cricket. For me, he has been the best world number three batsman I have seen especially in overseas conditions. It has been an honour to share the dressing room with you, to share some tough moments, to share some moments which had made each other angry but that is part and parcel of playing together. You deal with it and you forget it and move on. Your dad must be a proud man. You have always said the right things in your life, except one... that you will turn up to buy grocery. I think you should leave that to [wife] Vijeeta but, on a serious note, I enjoyed every moment. 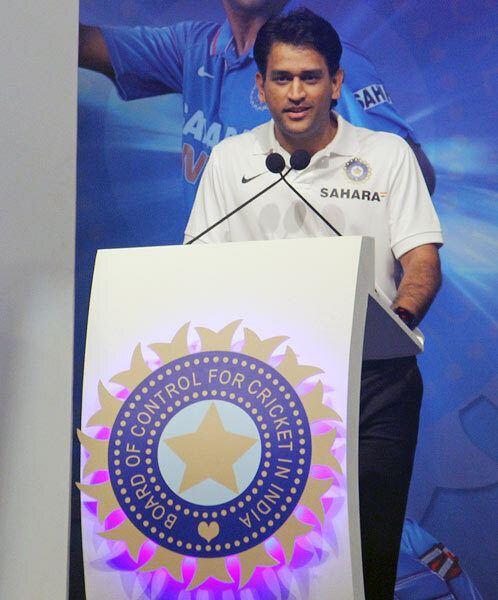 It's difficult to talk in five minutes about someone who has given so much to Indian cricket. It was always nice that Rahul was part of my team, whether he played for Karnataka or India. I would only to bowl at him in the nets. Otherwise, if he had been playing for any other international team, I would have to roll in more than 10,000 overs to get to the same number of wickets I ended up with in my career. Rahul, you have been a great player. Congratulations on a fantastic career, which you'll be very proud of when you look back. You'd many wonderful moments; of course, there have been some disappointments as well. But once you retire, I can gladly say that you'll remember only the wonderful moments that you shared with your teammates. About the 55 catches, it's been a great partnership, whether at first slip, silly point, short leg, gully, or your wicketkeeping, I thoroughly enjoyed it, Jam. When Rahul's first son, Samit, was born, one of our common friends sent a message, saying that 'caught David bowled Kumble' will continue. I messaged him saying, it was not going to be 'caught Dravid bowled Kumble', but 'caught Kumble bowled Dravid'. Because my son will not end up becoming a bowler, and I'm sure Rahul's son will not end up becoming a batsman. Because it's a huge task to score more than 23,000 international runs. It's easier to beat his dad's bowling records. He just has to take two wickets at the international level to be better than him. And, for my son, he has to score just 18 runs at an average to be better than his dad in batting. Well done, Rahul, on a great career! It's been a pleasure, an honour to be part of it. Just to sum up Rahul the person, we shared a lot of evenings out. He knew what I hated, what I would order, he would know what it was. When we were having discussions, he would be lost in his own thoughts. He would probably be preparing for the next day's batting, or analysing the day's play. This is what his commitment and pride for the game was. This is something that will be missed in the dressing room, not just on the field but off it as well. Congratulations once again, Rahul. I know the next couple of months you'll be busy and will enjoy your retired life, so to speak. But believe me, it is only going to get busier. I first met Rahul as a 16-year-old during the Under-19 days, when I was playing for Hyderabad U-19 and he was representing Karnataka U-19 in early 90's. Rahul went on to score hundred against us, but what made him different from others was his passion for the game; his technique and passion for the game. But, above all, you make out the huge difference between Rahul and other players on the park. It is then we went on to play for South Zone in Duleep Trophy and Deodhar Trophy before going on to play for the country. And our friendship really blossomed over the years; it was, in fact, a great relationship, a very memorable relationship, which I will cherish life-long. Rahul made his debut in 1996, as everyone knows, at Lord's, and he missed out to score a hundred on his debut. I knew he would be very disappointed to miss a ton on such a prestigious venue likes Lord's. But he proved how much effort, how much hard work and how much pride he has while representing the country. In the 2011 series against England, at Lord's, and seeing the kind of celebration he did after getting hundred, showed how much it mean to get a hundred at Lord's. And it also showed how much it means for him to play for the country. How much pride he takes while wearing the India cap and scoring more than 13,000 runs in Test cricket and more than 10,000 runs in ODIs shows the kind of hard work he did in practice to achieve those performances for the country. Rahul has been a selfless cricketer and the various roles he donned for the country shows that right from opening the batting in Test cricket in tough conditions, to keeping in ODIs, so that the combination in the team is right. To batting at various position shows how selfless he is and the team comes first, then individual performances. I wish Rahul all the best for the future, and the there is no doubt he will enjoy time with his lovely family. Even after so many achievements he has always been level-headed, and, for me, that is his greatness. His presence in the Indian dressing room will be surely going to be missed, but, Rahul, what a career you had! You have been a true role model for all cricketers who have played with you. I'm sure you will be contributing more to Indian cricket. And how passionate you are about domestic cricket and we discussed it whenever we met. And I am sure you will be contributing to Indian cricket in whatever manner you can in the near future. He is the greatest No 3 batsman ever produced by India. He always had the answer to everything. He always said yes. When we wanted a wicketkeeper, he was ready; when we wanted an opener, he was ready. As a wicketkeeper myself, I can say that he took some catches that a regular 'keeper would have spilled. These words of mine are not just from me, but a tribute from youngsters who have learnt a lot from Jam. Initially, I was very scared to go up and talk to him. I never called him Rahulbhai; I always called him Jam. I was fortunate and unfortunate to see the ups and downs of Indian cricket -- the 2007 World Cup when Rahul was the captain. But we won a lot of games after that under his captaincy -- and that was one of the best runs we had in one-day cricket. Dravid was someone who walked through obstacles, and not around them. He is leaving behind a legacy that will continue. What he has transferred to us, the youngsters, hopefully, we have learnt enough from you. I know you are always there to guide them when they need you.